Sometimes the way to dig up culinary history is just to get the ball rolling and see who responds. Recently, I did a small write-up on the Colony Martini, a version of the classic cocktail that was served at the Manhattan Cafe Society watering hole known as The Colony. The Upper East Side boite's heyday was from the 1920s until about 1960, and the Turkish bartender, Marco Hattem, was famous for shaking his gin Martinis with a bit of absinthe. One imagines that everyone once connected to the Colony is now lying out in Greenwood Cemetery of something. But yesterday, I was contacted by one Max Gabay, who said he was a 15-year-old bar boy at the Colony, working the bar with is mother's cousin, Hattam, after school! Max gave me some insight into how things were done at the Colony's bar. "The gin we most used at the time I was there was Gilbey's Gin. I used to fill about 50 clear-stemmed Martini glasses, and 50 red-stemmed Manhattan glasses with shaved ice at the start of the busy hour, to have them chilled at each end of the small bar. I also did set-ups for other drinks, but, as a teen, I did not handle any alcohol." He also confirms that there was, indeed, a small elevator that was used to hide the liquor during Prohibition days. Fascinating. The shaved ice and chilling of the glasses shows a seriousness in Hattam's preparation of cocktails. But, of course, the indentification of the gin used is the most tantalizing fact Max provides. 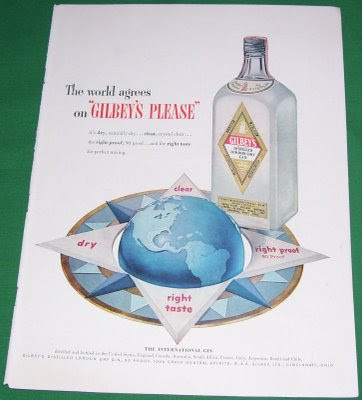 Gilbey's was an old brand by the time the Colony came into being. It was founded in the 1850s by Walter and Alfred Gilbey, who first established themselves as London wine merchants. They soon after got into the gin business, and established branches in Ireland and France. The company also produced rum, rye and scotch. The name lives on, though the family is no longer involved. There's an old Gilbey's ad from the 1950s above.